As 2014 quickly draws to a close, opXpeditions has time to squeeze in one last adventure before we replace the calendar on the wall. As always, we’ve got an amazing team for this one—Scott Wilson, writer and host of the Gemini award-winning travel series Departures, the mighty adventure-videographer Andrew Sheppard, and the laser-focused Ryan Edwardson on photographic and backup video duty! Oh, and me Robert Brodey, doing photography, writing, and when needed, Spanish translation. Qué pasa?! 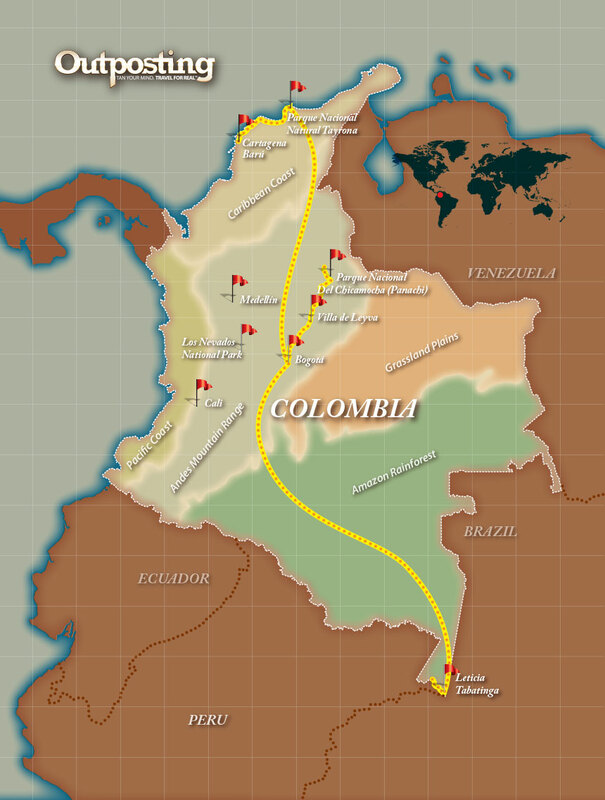 In many ways, Colombia holds a unique position in South America. Not only is it the gatekeeper to the narrow stretch of land—Central America—that ultimately links the southern hemisphere with North America, but the soaring Andes Mountains start here—or end here, depending how you look at the map. This is also the land of endless coastlines, and I might add, the only country in South America that borders both the Pacific Ocean and the Caribbean Sea. As an added bonus, I was told that Colombians are notoriously friendly, especially to visitors. ¡Chévere! Colombia’s immense and varied geography—from Andean plateau to Amazon rainforest to breezy ocean shoreline—has seen the country at the very top of the southern continent develop regionally. It’s this diversity of geographical and social landscapes that sets the agenda for opX Colombia. Our team will explore vastly different zones, including the great Amazon Basin, where we will fish with locals along the Amazon River, paraglide over the rugged canyons of Chicamocha in the highlands, and finally, journey to colonial Cartagena and the surrounding region to get a taste of Colombia’s Caribbean culture. Follow along, as we hike, canoe, paraglide, and horseback ride through this remarkable corner of the world. OpX Colombia begins Friday, December 5th. Stay tuned! Dec. 1, 2014, 11:48 a.m.